Somehow this post went from strawberry lemonade to puppies. Huh. Sometimes I wish I carried a voice recorder in my purse so that I could secretly record the conversations that Peter and I have when we go out to dinner. Friday night was such a night. Unfortunately for you, I don’t really remember what was so fricking hilarious at dinner on Friday night, so. Sorry about that one. But I assure you, Peter and I are fricking hilarious. The Easter bunny left me a $25 gift card that could be used at a number of restaurants, and Peter and I chose to go to a place called Longhorn Steakhouse. Neither of us had ever been, and we figured, hey. Why not? So, we went. It’s a pretty nice place with really great food. Like, REALLY great food. As in, stuff yourself past the limit of full, but then KEEP EATING when someone (coughPETERcough) says, “No. We are GETTING dessert. And you will EAT IT. And LIKE it.” Even as I’m sitting across the booth from him saying how I’m going to DIE because I’m SO FULL and how I need to LAY DOWN because OMGOODNESS my stomach is going to LITERALLY explode. Peter just couldn’t figure out why I was SO FULL. I figured it out quite quickly. On the beverage menu, they had strawberry lemonade. I LOVE strawberry lemonade, but I don’t drink it often because of a little incident that happened like OVER 2 years ago I think? Of course, Peter would be there. And of COURSE he would bring it up every time I’m even thinking about getting strawberry lemonade…. Flashback: Over 2 years or something… shortly after Peter and I started dating. Red Robin (yummmm). Characters include Skywalker Peter and one of our friends whom I shall call Brenda. We were sitting at one of those tables that has the booth on one side and the chairs on the other. Peter and I were sitting in the booth side, and Brenda was sitting in the chair. By the way – if you’re wondering why I remember every single detail of this horrific event, it’s because whenever we go to Red Robin and sit in the vicinity of where we were sitting that night, Peter says, “Hey, remember that time blah blah blah?” (don’t want to ruin the story for anyone). Anyways. I was on the end so I had easy access in and out of the booth. 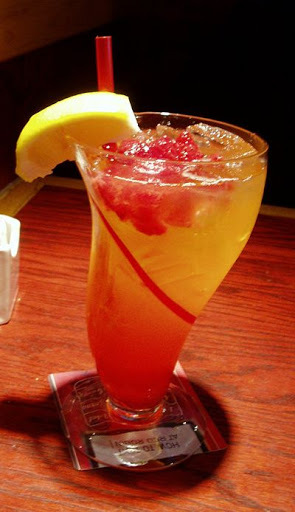 After browsing the menu (I can almost never make up my mind quickly when I am at a restaurant, because I toy with the idea of trying something new for so long, but then when the waiter/-tress comes along, I always panic and order the same thing that I always get), I decided on a strawberry lemonade as a drink. It is delicious. Something that you should probably notice before I continue: there are actual strawberry chunks in this delicious refreshment. As with any restaurant, we got our food before we got our drinks. Standard. I started sucking mine down because it was SO GOOD. YUM. Looking at this picture that I’ve just posted makes me want to drink one. As I was drinking away, the straw somehow became… clogged. So instead of being the mature adult that my mom tried teaching me to be, I just sucked harder on that dang straw. Before I knew it, a huge chunk of strawberry shot to the back of my throat, and I was gagging and spitting strawberry lemonade every where. And by everywhere I mean all over the table, my lap, and the (when I had the sense to steer away from the table) floor. Good thing I was on the end. I was coughing and choking and gagging all at the same time, and I didn’t know what to do. Strawberry lemonade was coming out of my nose and mouth and MAN did I drink THAT MUCH strawberry lemonade that it’s suddenly EVERYWHERE?! During the entire episode that lasted 45 about 2 minutes, Brenda is looking at me from across the table in shock, and Peter is staring at me with that why-am-I-dating-this-girl look of horror on this face. Awesome. Peter: Are you serious right now? Peter: Sar, EVERYONE saw you. This ENTIRE RESTAURANT saw you. Sara: Well, at least I’m alive. Sara: I need more napkins, I think. So yeah, on Friday night when I was looking at the strawberry lemonade on the menu, Peter made sure to remind me of THAT episode. So delicious, in fact, that I sucked down a glass and a half before we got our food. And then I was full. Too full to finish my steak (we brought it home), too full to even look at my baked potato, and too full for dessert. Which we NEVER get, I might add. But Peter wanted to like, go all out or something, and since we had a gift card (that barely covered one of our plates), he decided we could. Point of story: it was amazing food and we will be returning when we both get significant raises, and then when we DO return, I will be ordering water and not even look at the bev menu. I must say though, my favorite part of dinner was when a group of 4 walked in, and one of the men was holding a stuffed chicken. I’m being completely serious. He was carrying a stuffed chicken, cradled in his arm like it was a real chicken, and then he oh so conveniently set it on the ground, right where it would be staring at Peter and I during our entire meal. After dinner we went to see the movie Water for Elephants. A fantastic book that was also a (surprisingly) good movie. When we got out of the theater, I told Peter that I REALLY liked that movie. His response? “Yeah, you were crying the whole time…” No. For the record, I was NOT crying the whole time. Only during the parts of like, animal cruelty. I’m SORRY that I have a HEART. Speaking of animals, I hate dogs (and cats) (and all pets) (animals belong outside). Peter, on the other hand, LOVES dogs. Actually, now that I think about it, he has the same reaction to dogs as I have with (most) babies: “AWWWWWWWWWWWWWW! Look at that cute little puppy/babyyyyyyyyy. Isn’t she SO adorable??? ?” Or, if there’s an ugly one, “Yikes, check out THAT puppy/baby. Woof.” To Peter, all dogs are “puppies”. It disgusts me. One day, I was doing a little Facebook stalking, and I came across someone that I’m not really friends with, but we had a class together once or something, and she has a dog. 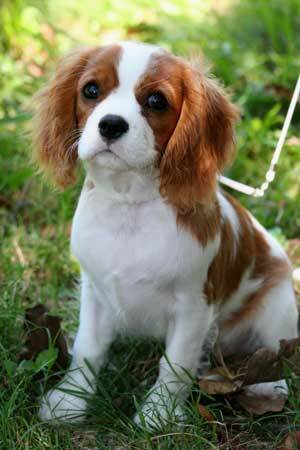 A Cavalier King Charles. Cute, right? Well, I made the MISTAKE of telling Peter that if God forbid we EVER had a *gulp* DOG, it would be this one and I am naming her Ruby. Slow down there, killer. You think this whole puppy-thing is happening soon? Try like, 20 years down the line… MAYBE 20 years down the line. For the record, this conversation happened in like February or something, and dear Peter is still talking about our never non-existant puppy named Ruby that I “agreed” to having. For the record: Not liking dogs doesn’t make me a bad person. It just makes me a person that believes animals belong outside. Not inside where they can shed and bark and drool and poop and pee on the carpet and jump on you and rip your clothes and eat your shoes and smell bad. I’m being 100% serious right now. Peter – As a fellow dog-lover, I'm convinced Sara just hasn't had the perfect indoor best friend yet, and it sounds like Ruby would be the type of puppy to change her mind. Go for it! Sara, McDonald's now has chunkless strawberry lemonade…. Everyone else, I told you it has been hard taking Sara in public! !